The top two floors of the historic building promise panoramic views of the stunning Montepulciano landscape! These 6 self catering holiday rental apartments in the city center of town are spacious, with lots of natural light, great views and easy parking. Choose to stay in the middle of an active Tuscany town and enjoy the small boutiques, the local restaurants, a morning at the caffè or an afternoon at the enoteca sampling wines. Politian Apartments, with its newly refurbished one and two bedroom apartments makes it easy to create an itinerary exploring Tuscany because of its prime position and proximity to major roads and towns. Each of the 6 self catering rental apartments for holidays and vacations in Tuscany guarantee a unique floor plan, thought out specifically with optimizing the great views, sunny position and the convenience of being in the city center. The apartments, creatively named after the owner’s passion for tea, are one and two bedrooms accommodations with a fully equipped kitchen, private bathrooms and large panoramic windows. Take complete advantage of the on site washing machine, iron & ironing board, SAT TV for European shows, free internet service and dishwasher, over and utensils for a little experimenting in the kitchen. Most historic buildings, like this one which was built next door to the “palazzo” where Poliziano was born (Politian, a famous Renaissance scholar and poet), hide a private garden area. The combination of restaurants and stores within walking distance, easy parking and a lush green area where you can escape into a private sanctuary makes Politian Apartments truly a one of a kind home base while on holidays in Tuscany. Find your accommodations according to size and views! Mint Tea, just newly refurbished for 2016, is the smallest of the apartments but all of its windows face the private garden, guaranteeing silence and tranquility. Perfect for a couple on holiday or a single traveller staying within the city. Jasmine overlooks the valley below Montepulciano and boasts a newly refurbished living room area where you can take advantage of the fresh breezes from the top floor of the palazzo. Red Tea, a two bedroom-two bathroom apartment, is located on the first floor with direct access to the private gardens behind the villa. Enjoy a leisurely breakfast on the patio or a picnic dinner with goods from the many nearby shops. Black Tea is made especially for 2 persons, and has the advantage of over 60 square meters, one full bedroom with a queen size bed and a private bathroom all on the top floor of the mansion. White Tea is another two bedroom - two bathroom apartment for 2 - 4 persons at Politian Apartments. There is a fully functional fireplace for cosy moments curled up on a chilly fall or winter evening. Especially nice is the panoramic balcony with a full view of the landscape surrounding Montepulciano. The last of the 6 apartments is Green Tea, it possess direct access to the garden area and its very own fireplace. When making your reservations, let the owner know what you are looking for and they will best be able to guide you to the perfect apartment. Guests often appreciate their availability during their stay to answer any questions about moving around in Montepulciano or planning day trips to one of the many closeby areas for wine tasting, outlet shopping and sightseeing. Montepulciano, an active city with several lovely points of interest...not the least of which are the delicious restaurants, cozy caffeès and shops with local products and wines, is a delightful place to base your holiday vacation. Take time to visit the beauties nearby like Pienza, with its spectacular views and yummy pecorino cheese or heading over towards Cortona, another hilltop town - but with a completely different perspective of Tuscany. 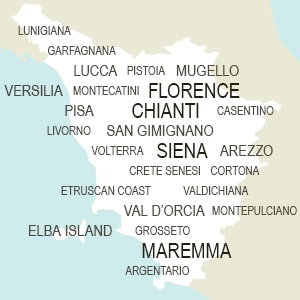 Visit the town, the boutiques, the Etruscan museum and find your favorite gelato shop. This area is rich in its diversity in wine and every little town will have several cantinas for you to explore and savour. Plan on a few daytrips with the convenient autostrada (main north south highway 20 km) and take in the sites at Siena, with its massive Duomo and particular town square. Enjoy one of its many restaurants and don’t forget to taste some of the home baked desserts known to Siena. A drive to Arezzo, with its antique shops and Medici Fortress, will have you enjoying a genuine and authentic Tuscan town filled with artists and a Roman amphitheater. Florence is a must see for any itinerary to Tuscany, the cradle of the Renaissance will have you marvelling at the beauty and elegance in the architecture, artwork and artisans.